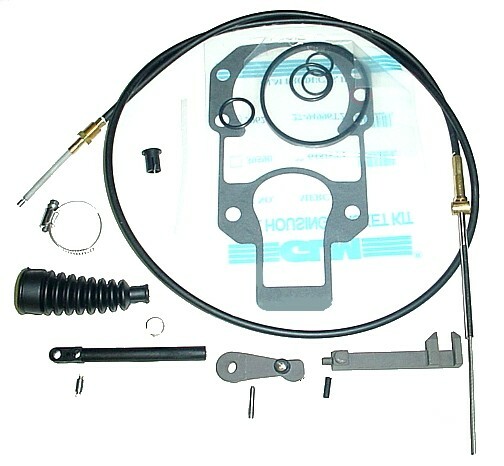 This is MerCruiser p/n 91- 865232 ( Old # 91- 809815A1 ) outdrive installation tool. It is used on all #1 drives including Pre-Alpha, Alpha One and Generation II drives made from 1965 to Date. This will not fit Bravo. This tool snaps over the lower right outdrive mounting stud and holds the shift cable slide in position while installing the drive. Once the drive slides onto the studs and is within 1/2" of the bell housing, you pull the tool off of the stud. This cable threads from inside of the bell housing. Boats which were made from 1965 to 1983 had cables which threaded in from behind the bell housing. These cables are no longer available to us. To use this cable on boats made from 1965 - 1983, you will have to modify your bell housing by running a 1/4-18 pipe tap from inside of the bell housing. Shipping Wt. 2 1/2 Lbs. 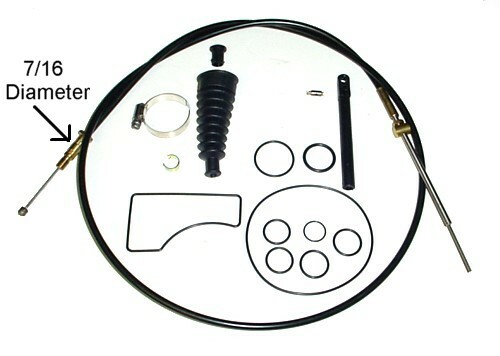 No exchanges or credits on any portion of this kit. 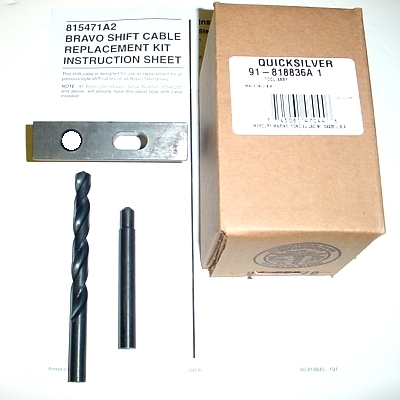 Click here for shift cable socket. Click here for crimping tool for the small shift cable bellow clamp. Click here for the 2 cables going to the control handles in front of the boat. 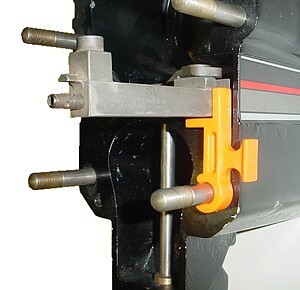 Boats made from 1965 - 1983 can use the above shift cable kit by running this tap from inside of the bell housing to just 4 threads short of the end of the tap. Your threads already come thru the hole in the bell housing, you just have to put the taper from the opposite side. 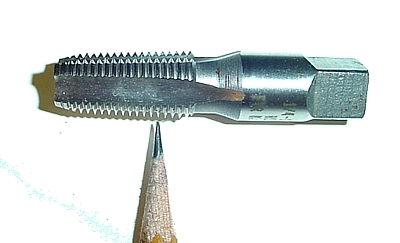 Use some WD-40 and a socket to drive this tap in from the opposite side. The 9/16 brass fitting on the end of the shift cable must almost touch the bottom of the bell housing when it is tightened down. Please Note ! The taps we were selling required a 1/2" 12 point socket to reach inside and drive the tap. The newer taps we have now require a 10mm 12 point socket or you can lightly grind the 4 corners of the tap to fit a 3/8" 12 point socket. : Order # 0016 Sorry, there are no returns on this item. This cable does not have a tapered brass fitting. It uses a nut to hold the cable inside of the bell housing. A standard socket will fit this cable. This cable assembly will fit all Bravo drives ser #OD542204 and above. On serial #OD542204 and below, the thru hole in the bell housing will have to be enlarged to 7/16 dia. to accept the newer cables. The smaller diameter cables are no longer available. This is MerCruiser p/n 91- 818836A1 drill fixture assembly. It is used to enlarge the through shift cable hole in the bell housing on Bravo drives with serial number OD542204 and below. Click here for instructions to use.